By Rafal Brzeski and Robert Eringer. This book is quite unique as it was written at the time that events (the strikes which created the Polish Solidarity union in 1980) were happening and from an outside perspective. Most importantly it was created without the benefit of grand hindsight with which history is framed. Well, a very slight hindsight of months rather than years. 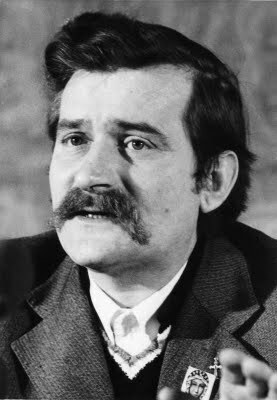 Wałęsa is not admired by many in Poland nowadays: his lack of formal education, the gaffes and that it has been widely reported by the largely hostile media that he was in league with the communists. An ongoing investigation by the National Remembrance Institute reported late last year that documents were fabricated by the communist government in the 80s. Of course this is the kind of stuff that can stick regardless of the truth. It seems the qualities that made Wałęsa an effective mouthpiece are now those which are held against him. He was a working man and had not been taught the niceties of politics as all our politicians seem to know now. He was a maverick and had no fear, could think outside the box and was a talented improvisor. The communist authorities simply didn’t know what to do – they couldn’t control him, he didn’t fit into their framework. While, in the short term, the Polish people didn’t change the system immediately, through the auspices of solidarity, these first steps gave confidence. I must tell you that the supply of words on the world market is plentiful, but the demand is falling. This entry was tagged Brzeski; Rafal, Eringer; Robert, Wałęsa; Lech. Bookmark the permalink.